Even though it was made available several months ago, Facebook yesterday officially announced the release of their Facebook Messenger for Windows. The social networking giant also promised that an Apple OS X version will be available soon. News of the new Messenger desktop client surfaced in December last year, when details were leaked to the media. Rather than cover up the leaked information, Facebook confirmed the news by detailing it in the Facebook Help Center. The new Messenger works on Windows 7 and automatically updates itself. It provides the three main Facebook features: chat, the new ticker feed and notifications. You initially sign into Facebook in your browser, but once signed in you can close it, and use messenger to see and respond to conversations from friends instead. To log out when you’re finished, you just sign out from inside the application. Facebook's Messenger will also instantly display any notifications for new comments, photo tags as well the usual host of notifications in the same way you receive them when using Facebook in the browser, all without having to keep the browser window open and in view to see updates. It can be snapped to the side of the screen, which is perhaps why they haven’t released a version for earlier Windows operating systems. The company also hinted that future revisions may offer chatting with multiple friends, video calling features, the ability to limit chat availability and the option to edit your settings from inside the application. 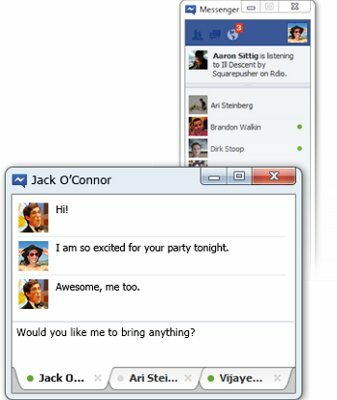 Facebook Messenger for Windows is available for download here.